ExecutiveCoach.com is the remote delivery arm of Change Masters® Incorporated. Technologies now make it possible to use new, more effective ways to build leadership and communications skills. The global reach, 24/7 time demands and a challenging business climate requires that we learn to be more efficient than ever and be more effective. We are very excited to bring new and powerful coaching to individuals and teams dispersed around the world in a mnner that is more efficient and effective. ExecutiveCoach.com delivers power remote coaching on a global basis. The Virtual Workshop is very personalized to the individual participant while being a powerful group or team activity. All of the elements are delivered virtually, so the participants do not need to be in the same location. It will easily accommodate teams who's members are traveling much of the time or in the same location. ExecutiveCoach.com is the remote delivery arm of Change Masters® Incorporated. Change Masters has specialized in one-on-one coaching to executives in large organizations around the world since 1986. 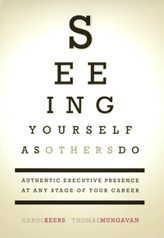 In 2008, we published the book "Seeing Yourself as Others Do - Authentic Executive Presence at Any Stage of Your Career", which has been very well received around the world. It has allowed us to create tools to reach more people cost effectively. Change Masters continues to offer in-person individual coaching, keynotes, presentation coaching and workshops. The ExecutveCoach.com expands those services to meet the needs of modern business because we can with today's technology. © Copyright 2009 Significnat Pursuit Institute, LLC. All Rights Reserved.